We updated the English version of our popular book the Iceland Road Guide. The Iceland Road Guide book has been on the market since 1975. The new 2016 edition Road Maps are for sale in all bookstores, most tourist information centres and fillingstations. Some unique features of the map are explanation of Icleandic place names – night & daylight scheme – list of volcanic eruptions from the year 1700 – 2014 – photos and information for 34 tourist atractions around the country in addition to important tourist information such as accommodation – camping sites – museums – filling stations – swimming pools – natural baths – boat tours etc. Map with App is available in three languages, English, German and Icelandic. To the right on this page you can see the functions of the App. In the Iceland Road Guide App you will find more than 3000 places and thousands of services around the country, places with information and pictures, map browser and much much more. Iceland Road Guide Map is now available in six languages, English, German and French with yellow cover and Spanish, Chinese and Icelandic with blue cover. Map with App – a splendid travel companion in Iceland. Ný og endurbætt útgáfa af Vegahandbókinni er komin út. Bókin er hafsjór af fróðleik um land og ljóð, algjör lykill að landinu. Kortabók, 24 síður, í mælikvarðanum 1:500 000 er í bókinni, sem gefur góða yfirsýn. Laust yfirlitskort fylgir einnig með. Meðal nýjunga í ár eru upplýsingar um heitar laugar og heilsulindir. Með því að skanna QR kóða fást upplýsingar um GPS hnit staðanna auk mynda og frekari upplýsinga um staðina. Með því að nota QR kóða er einnig hægt að hlusta á fjöldan allan af þjóðsögum í símanum. Vegahandbókar App fylgir hverri bók, þar er að finna alla þá staði sem eru í bókinni ásamt þúsundum þjónustuaðila um land allt. Bækurnar fást á bensístöðvum N1 og Olís og ef farið er með eldri útgáfur í bókabúðir fæst 1.500 kr. afsláttur á nýrri bók. 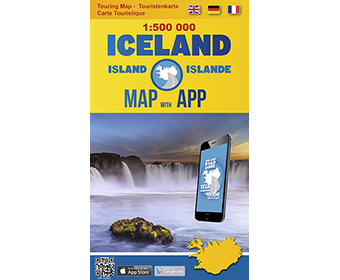 I We are proud to announce our new 2015 edition Map and now with the Iceland Road Guide book in an App. The App is available in three languages, English, German and Icelandic. To the right on this page you can see the functions of the App. Map with App is available in bookstores, most tourist information centres and fillingstations. We are now updating the English version of our popular book The Iceland Road Guide. It will be ready on the market in May. The Iceland Road Guide book has been on the market since 1975. The last version, since 2013 is sold out. 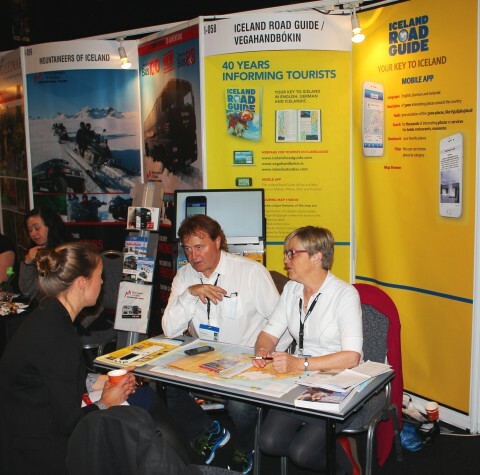 The Icelandair Mid-Atlantic Tradeshow 2015 will be held in Reykjavík on February 6th. It´s an annual tradeshow where travel industry professionals from around the globe to meet, work together and exchange ideas. We will be there with all our products, Apps – Maps – Books. Our Tourist Map for 2015 has been uptaded and will be printed after the tradeshow. May be we will get new ideas or information to have on the new edition. We are looking forward to see you at our stand on February the 6th. Thanks to all the nice people who visited us at our stand at Vestnorden Travel Mart in The Reykjavík Sports Hall on September 30th and October 1st and thanks to the organizers, Congress Reykjavík, they did a really good job.